Quick Overview: Spiral Wound Gasket is one of the widely used seals, the spiral wound gasket depends on the mechanical characteristics of a formed metal strip which works as a spring, offering a better resilience under fluctuated pressure & temperature. They are widely used in the industrial field and fluid sectors. 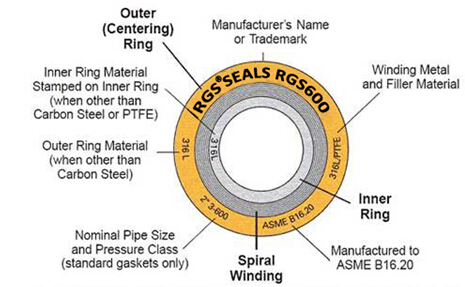 RGS 600 spiral wound gasket is formed of V-shaped Metallic strip and soft non-metallic filler. Support rings, inside and Outside the spiral, improve the gasket's handing, fitting and Versatility. Depend on its excellent compression resilience, it is suitable for sealing spots where the alteration of temperature and pressure are frequent. ● Basic construction type, inner and outer diameters are reinforced with several piles of metal without filler to give greater stability and better compression characteristics. ● Recommended flange tongue and groove, male to female and flat face to recess. ● General and critical duties. ● Solid inner metal ring acts as a compression stopper. 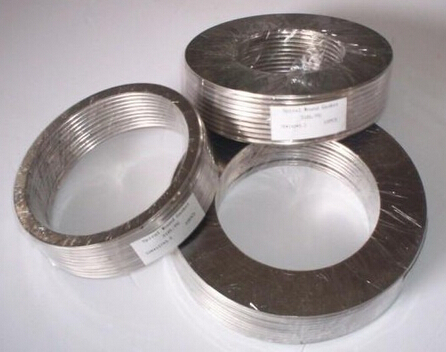 To prevent accumulation of solids, reduce turbulent flow of process fluids and minimize erosion, damages of gasket between flange bore and the inside diameter, the annular space is filled up by solid inner metal ring. ● Suitable for male and female pipe flanges. ● Solid outer ring accurately locates the gasket on the flange face to give the additional radial strength to prevent the gasket blowout and acts as a compression limiter. In case of installing the outer ring, it is very easy to install the gasket to flange face because the end of outer ring will touch at bolts. ● Suitable for use with flat face and raised face flanges. For class 900 and above an internal ring is recommended. ● A inner ring and outer ring type gasket will give an additional compression limiting stopper for gasket inner and outer side. It will prevent the corrosions on flange face at annular space. ● Suitable for use with flat face and raised face flanges and specified for high pressure / temperature service - Class 900 and above or where corrosive or toxic media are present. * Pipe, valve, pump, thermal exchange, condensing tower, plain hole and man hole of flange, etc. * Gasket are made in a wide variety of sizes and shapes. * Combinations of metal strip and filler are selected to suit the specific fluid media and operating conditions. * Make gaskets suitable for high pipeline pressure on flat or raised flange faces. * Products are manufactured in accordance with all relevant gasket standards to suit flange designations: ASME B 16.20, ASME B 16.5, BS1560, ASME B 16.47 A (B), BS EN 1092, DIN, JIS, and NF, etc. * Color cord as ASME B 16.20 on request. * Provide complete range of materials spiral wound gaskets, combining the performance of the materials. Including Monel 400/ Inconel 600,625,800,825/ Hastelloy B3/ Hastelloy C276/ Titanium,etc. Range of fillers: Graphite, PTFE, Non-asbestos, Mica, etc. * Between 1/2'' ~ 24'' gaskets are packaged by plastic clips each 10 pcs. * Up to 24'' gaskets packaged by soft cotton tape each.